Place lentils in Instant Pot along with turmeric, salt and water. Turn steam release handle to "Sealing" position. Select "Bean/Chili" and set time for 7 minutes. Press "Cancel" and let Instant Pot naturally release pressure until float valve drops down and lid unlocks; alternatively, press "Cancel" and let Instant Pot naturally release for 10 minutes; then turn steam release valve to "Venting" until float valve drops down and lid unlocks. Meanwhile, make Tempering Oil. Have all Tempering Oil ingredients measured out and ready to go. Put oil and mustard seeds in a small pan. Cover pan and listen for mustard seeds popping. Once mustard seeds start popping (~ 1-2minutes), add cumin seeds, cover and let cook 30 seconds. Add dried red chilies, green chili, curry leaves, and garlic, and cook another 30 seconds. Remove pan from heat and add cayenne and a few drops of water to stop the cooking process.Select "
Saute" function on Instant Pot. 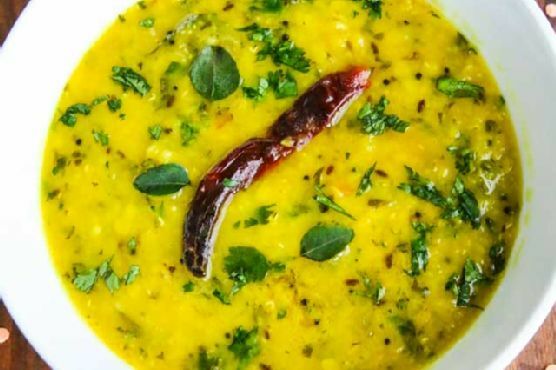 Stir half the tempering oil, half the cilantro and all the lemon juice into the dal. Simmer for 5 minutes. Place lentils large saucepan along with turmeric, salt and water. Bring to a boil, then reduce heat to medium-low and simmer, covered, until lentils are soft, 20-25 minutes.Meanwhile, make Tempering Oil. Meanwhile, make Tempering Oil. Have all Tempering Oil ingredients measured out and ready to go. Put oil and mustard seeds in a small pan. Cover pan and listen for mustard seeds popping. Once mustard seeds start popping (~ 1-2minutes), add cumin seeds, cover and let cook 30 seconds. Remove pan from heat and add cayenne and a few drops of water to stop the cooking process.Stir half the tempering oil, half the cilantro and all the lemon juice into the dal. Simmer for 5 minutes. Transfer to serving bowl, pour rest of tempering oil on top and sprinkle with rest of cilantro.